Takeover is a Zero Mission hack with layout changes, changed tilesets, sprites, and palettes. Overall the hack was fun and I enjoyed it. Couldn't find all the powerups though. 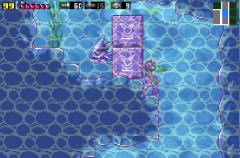 Believe I was missing screw attack, gravity suit, and plasma beam.You can traverse the Sunken Caverns pretty early if you got the ice beam, which was the last item I found because I missed obvious blocks to blow up to get to it. Certainly not the best hack out there, but pretty solid for (to my knowledge) a first attempt. The room design could use some work (a lot of tile errors/misuse and can be pretty blocky), and the map could use some work too. For a veteran difficulty hack, it's pretty easy too. The most fun I had with the hack was traversing Norfair for the first time. The platforming was difficult and fun, and whenever I messed up it felt like it was my fault and not bad design. Going through the heat runs was pretty good too, but I'll admit I'm pretty sure I didn't get everything I was supposed yet to before I got into Norfair. Overall, a decent hack, and I look forward to future hacks made by Spedimus. This is probably the most conflicting hack I have ever played. The level design was amazing at times, and then downright frustrating at other times. I spent a lot of time grinding for power bombs as sometimes you will get locked in an area where power bombs are required to progress but there are no refill stations. The map/world is by far the largest that ZM hacks have to offer. IMO this made in-area-pacing pretty good, it wasn't like you were just running into item after item, you actually had to look for items and it felt extremely rewarding when you did find one. To add to that, it was like whole sections of the map opened up when you found an item, which was incredible. In a way it felt like each area had "tiers" that open up when you found an item. However, because of the "tiers" and how the map worked, the backtracking was extremely painful. If there were interconnected sections running throughout the map to make backtracking easier, I certainly didn't find them. 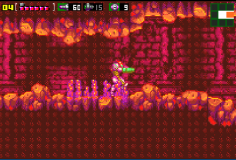 The fact that the route from norfair to kraid in brinstar is basically a big line and the least fun of all the areas to traverse through definitely did not help. Maybe its just how I played the hack the first time around, but I spent a lot of time backtracking to see what exactly i had opened up in each area. I would have to play it again or open it in mage to see if they exist, but the game could really benefit from more connecting passages. There were a few graphical bugs, like the sprite for mecha ridley was all messed up, and some platforms we'rent displaying correctly (actually not sure if that was intentional or not), but nothing too major or gamebreaking. The gameboy soundchip could clearly not handle the music at times, but I don't necessarily think that's Spedimus' fault. 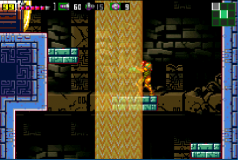 Because of the size, it really feels like a full-on metroid game rather than just a hack, which I think is the first ZM hack that has made me feel this way. Despite the issues I touched upon, I really enjoyed it and would say it is absolutely worth playing through. It might even get me to make a 100% route for it.